Here in the Nordic area, the climate gives us highly defined seasons: Nothing says spring quite like melting snow, blossoming flowers and sprouting leaves. Our summer days are bright and long—in the north they even have midnight sun—which during winter becomes the complete opposite: Hardly any sunlight, tons of snow and temperatures way below zero. With that in mind, it’s easy to understand why nordic people are so good at creating cosy atmospheres tailored for togetherness—an essential aspect for keeping our minds and relations warm during the cold season. 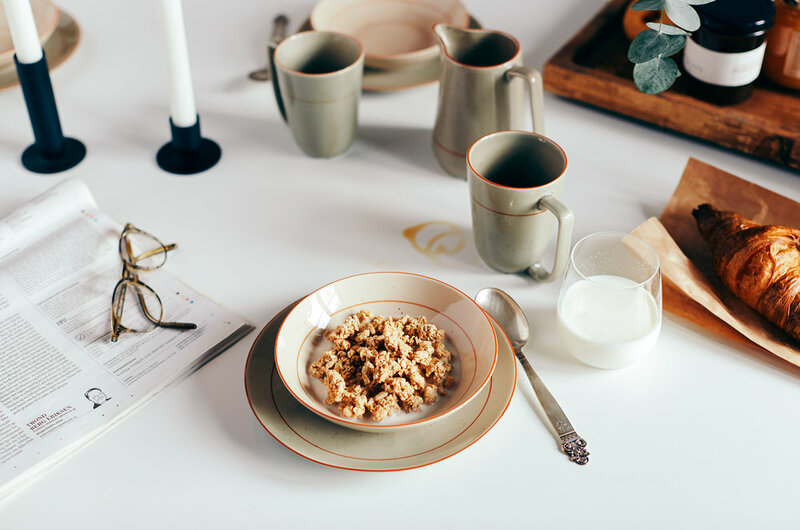 Together with Norwegian tableware designers Wik&Walsøe, and interior architect Sabine Bolstad, we spent a full day exploring different ways to achieve a warm, vivid and Nordic dining table—from early morning, until late at night. Keep it casual. Light candles and use a trencher or a tray to stack cups and plates, it makes it easier to set and clean the table. And you can easily let it be a bit chaotic—newspapers and magazines create a relaxed atmosphere. 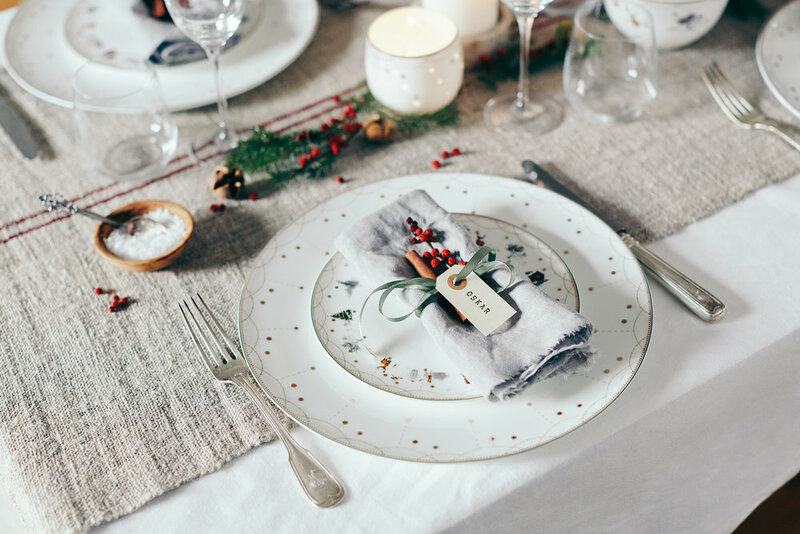 Stay a bit loose and free when you set the table. You can for instance tie the cutlery and napkin together with a flower sprig. You can also elaborate by including lavender in the binding. Since Christmas is coming, I’ve chosen to use a bit of self-picked spruce and twigs in the Falla vase. 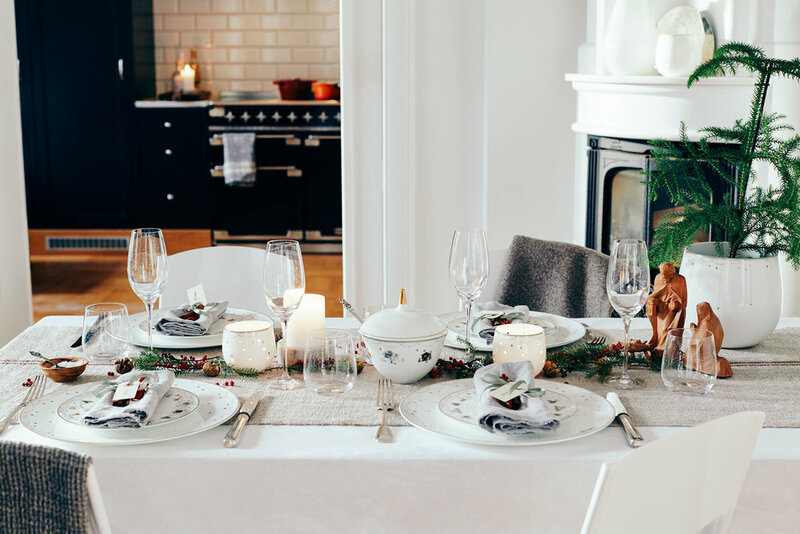 For a relaxed atmosphere, mix different natural elements like spruce, dried berries from mistletoe and rough linen. I like to keep the table decorations looking natural, that's why I've chosen a bright colour palette with just a little hint of red. Don't make the table decorations too tall, that way it won’t interfere between the guests. If you want larger decorations, place them at the end of the table. And feel free to use nostalgic Christmas decorations to create a more personal feel. If you have silverware, use it. There's no reason to keep it hidden away in a drawer. Wik & Walsøe products in this series: Julemorgen Benporselen, Røys Stengods, Rustikk Porselen and Woodstock Porselen.